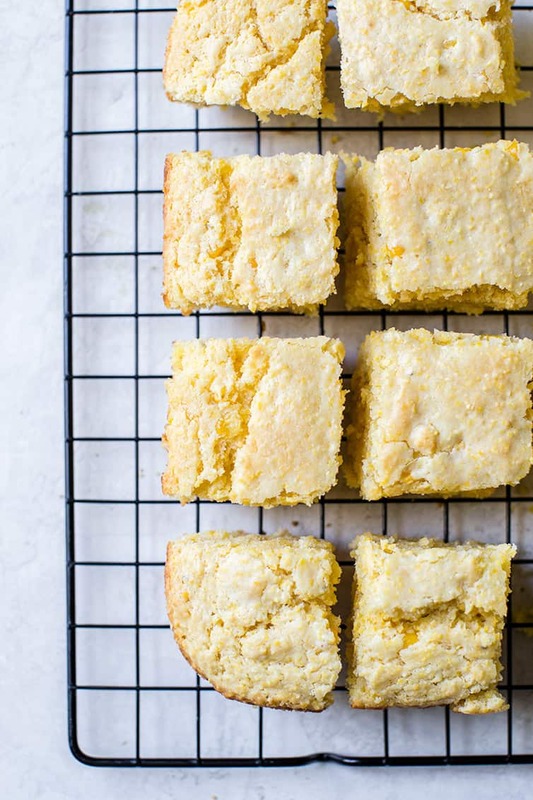 This easy cornbread recipe is extremely moist, made with buttermilk and real corn, and it comes together in less than 10 minutes. It will become your go-to recipe to enjoy alongside ribs, chili, or any of your favorite meals! If I go to a restaurant and open the menu and see cornbread listed somewhere, I feel like I’ve hit the jackpot. Bonus points if it’s served piping hot with some honey butter on the side. The absolute best restaurant cornbread I’ve ever had was at Copper Canyon Grill in Rockville, Maryland. I could have eaten the entire pan and made it my meal, but I restrained myself. 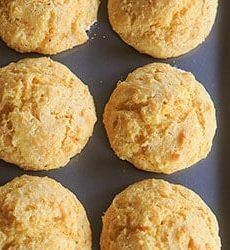 When I make cornbread at home, I always turn to this recipe, which has been my go-to for well over 10 years now. It’s an extremely quick recipe to prepare, comes out wonderfully moist every single time, and the leftovers stay fresh for days. 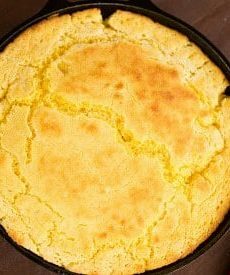 I’ve tried many others, and while there are tons of great cornbread recipes out there, I always come back to this one. It’s simply the best. It’s super easy to grab a cornbread mix, add a couple of ingredients and toss it into the pan, but honestly? This is not much more involved and it tastes SO much better! 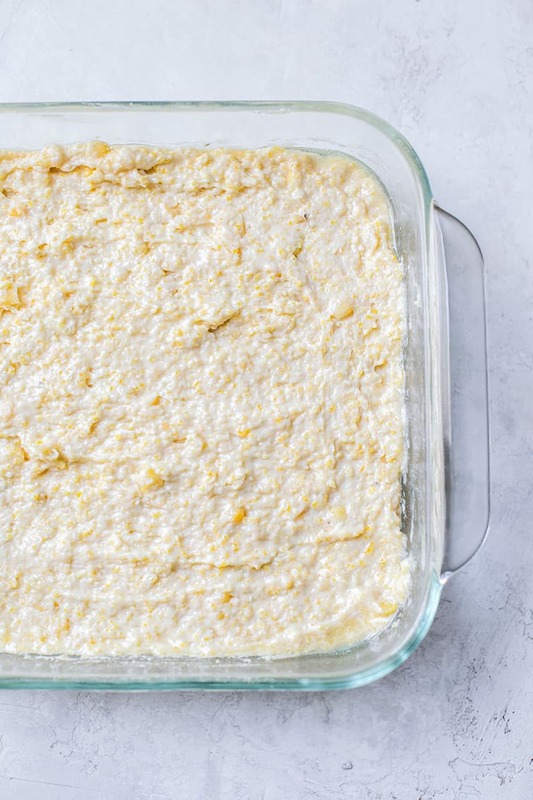 If you keep a bag of corn in the freezer and buttermilk in the refrigerator, you will likely have everything you need to throw this together in less than 10 minutes. All it takes is a bowl, a blender or food processor, and a spatula. That’s IT! First, whisk together your dry ingredients in a large bowl. 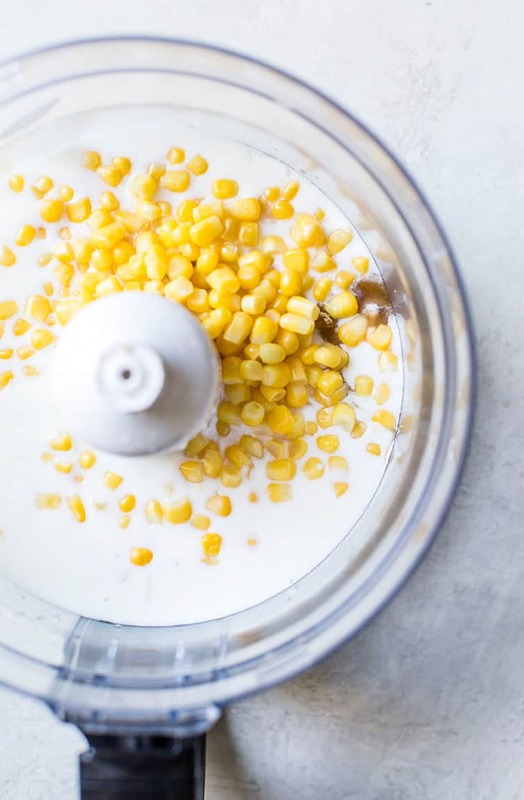 Then, bust out your food processor or blender and give the corn and buttermilk a quick spin. Add the eggs and process a few seconds longer. Add your blended corn mixture to the dry ingredients and stir together briefly, then add the melted butter (mmmm butter!) and stir until mostly combined. BIG TIP: Do not overmix! You just want to make sure the dry ingredients are moistened, but lumps are okay! Spread it into a square pan and pop it into the oven. Done! The resulting cornbread is crusty on the outside, moist on the inside and loaded with bits of real corn. It is absolutely delicious all on its own, but I will also never turn down a smear of salted butter (or honey butter if you’re kicking things up a notch!). 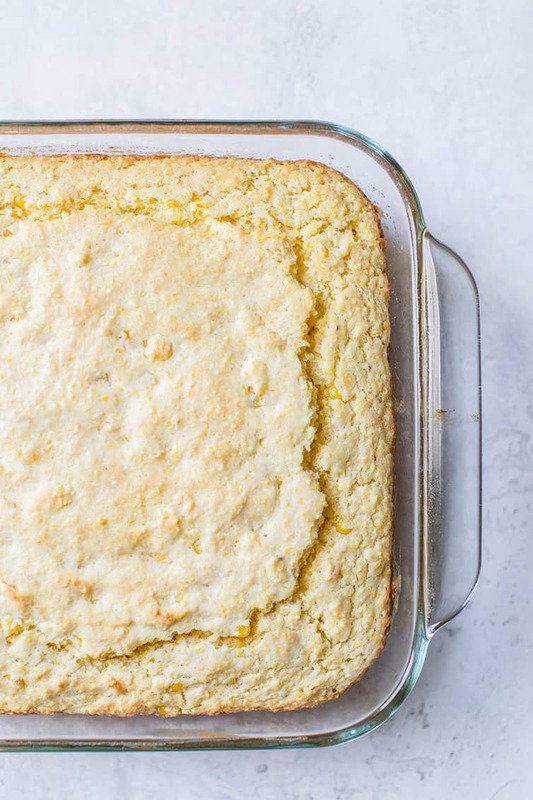 This easy cornbread recipe is extremely moist, made with buttermilk and real corn, and it comes together in less than 10 minutes! Preheat oven to 400 degrees F. Spray an 8-inch square glass baking dish with non-stick cooking spray. In a large bowl, whisk the flour, cornmeal, baking powder, baking soda and salt until combined; set aside. 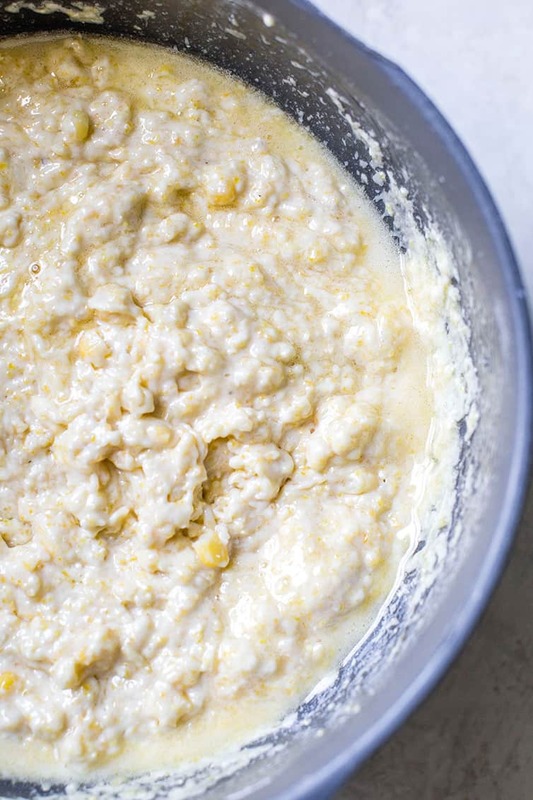 In a food processor or blender, process the sugar, thawed corn kernels and buttermilk until combined, about 5 seconds. Add the eggs and process until well combined (corn lumps will remain), about 5 seconds longer. Using a rubber spatula, make a well in the center of the dry ingredients; pour the wet ingredients into the well. 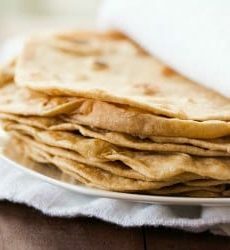 Fold the dry ingredients into wet, giving the mixture only a few turns to barely combine; add the melted butter and continue folding until the dry ingredients are just moistened (do not overmix!). Pour the batter into the prepared baking dish and smooth the surface with a rubber spatula. Bake until deep golden brown and a toothpick inserted in the center comes out clean, 20 to 30 minutes. Cool on a wire rack for 10 minutes, then invert cornbread onto wire rack, turn right side up and continue to cool until just warm, about 10 minutes longer. Cut into squares and serve. Leftovers can be stored, covered, at room temperature for up to 3 days. 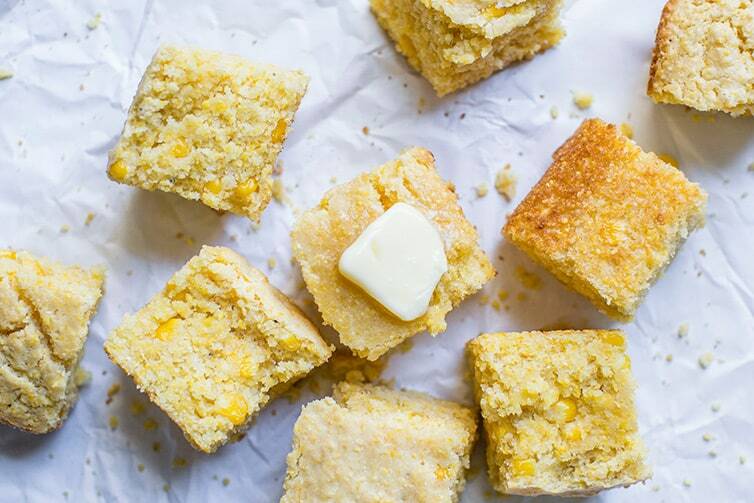 To freeze the baked cornbread, cool completely then wrap well in plastic wrap, then in aluminum foil, place in a ziploc freezer bag and freeze for up to 3 months. Allow to thaw in the refrigerator, then remove the foil and plastic wrap, wrap loosely in aluminum foil and reheat in 350-degree oven until warmed through, 20 to 30 minutes. Update Notes: This recipe was originally published in September 2007. It was updated in July 2015 with new photos, then refreshed in September 2018 with more new photos and extensive recipe tips. This recipe is delicious. I followed the recipe exactly, except I thoroughly processed the corn per personal preference. Thank you for such a wonderful recipe! Made this yesterday along with your Italian wedding soup. 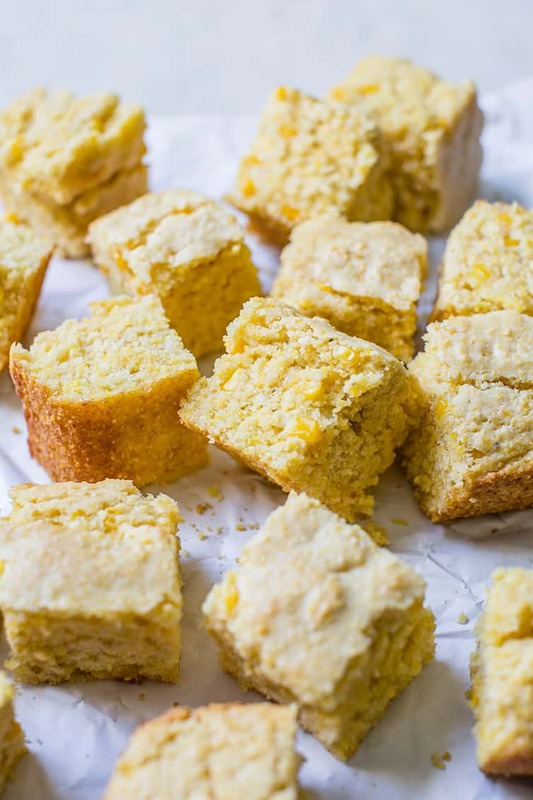 This is a great recipe-moist cornbread with great flavor. Will definitely use this recipe again. I made the corn bread tonight. It came out good, although I think I may have undercooked it a bit. The next time I make it, I thought about putting either jalapeños in it, or maybe some pepper jack cheese for a little kick. If I did put in the cheese, how much would you recommend ? Hi Donna, I would probably use 3-4 ounces! Why dirty the food processor? Use creamed corn instead, you still get pieces of corn and the cream mixture produces a really moist bread. Also, I only use 1 Tbsp. of sugar, the corn is already sweet. If you ever ate at a Tippin’s restaurant, you’d remember their fluffy, sweet, scrumptious cornbread. The copycat recipe for it uses two boxes of Jiffy Cornbread Mix and on box of Jiffy Yellow Cake Mix. When combined per the box instructions, it makes a 9 x 13″ pan of cornbread. I make an 8″ pan using one box of Cornbread Mix & one half box of Cake Mix. You could add corn or cheese if you wanted to. You might give it a try.